Last summer, Blair Hickman retraced a 12,000 mile cross-country road trip in memory of her mom, who died from cancer in 2003. The girls retraced a path their mom had taken in 1977, serving dinner at 9 Ronald McDonald Houses and raising money for the charity along the way to raise awareness about the importance of non-medical support for families living with cancer. They blogged and vlogged the whole way, raised over $7,000 for the charity and in the end, found a little more than they’d bargained for. 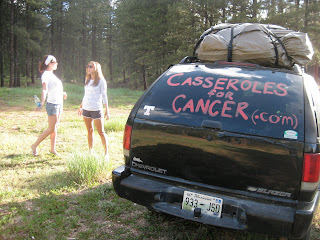 To read more about their adventures, go to http://casserolesforcancer.com. Our three-day jaunt through America’s armpit had introduced me to the Tao of Travel, something that I completely made up but also believe the Buddha would fully endorse. It’s a complicated, nuanced ideology, but essentially, it’s based upon the belief that if you try to control things whilst traveling, you will go insane. The Tao came at quite the opportune time, as we urbanites embarked on a 10-day camping expedition. We camped all the time when we were little, but I always ended up huddling at the bottom of my sleeping bag while it stormed outside. 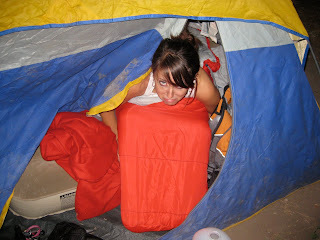 Also, one time, Kelsea almost died after coming down with a terrible flu. But for some reason, we were all giddy as we headed down the mountain road into Oak Creek Canyon for our first real camping in a good 11 years. We arrived at our first campground, Bootlegger, in the dark without water, food, light, batteries or cash. There was no running water, two other campsites blocked access to the creek and the bathroom was just a giant, un-lit, in-ground porta-potty that they don’t clean over the weekend. Steph drove off into the dusk to retrieve the items necessary for our survival, while Kelsea and I huddled at the picnic table and stared at each other. Two hours later, she returned with four chicken wings for the three of us to share. We ate cold green beans out of a can and went to bed with full bladders because going to the bathroom was like actually going inside of a pile of someone else’s poop. The next morning, under the guidance of the Tao, we loaded the tent back into the Blazer and went in search of one of Sedona’s four vortexes, pockets of electro-magnetic energy akin to homeopathic Valium. Many with allergies, asthma, arthritis and all kinds of diseases that start with letters besides “A” flock to the area for the healing power swirling between the Red Rocks. Since we all have allergies and a not-so-secret desire to have our auras read, we hiked up Bell Rock in search of enlightenment and did yoga on top, just for good measure. We spent the next few days galloping through the deserts of Northern Arizona on our trusty steed, Black Betty. We stopped at the Grand Canyon, a trip we’d taken together several years before. 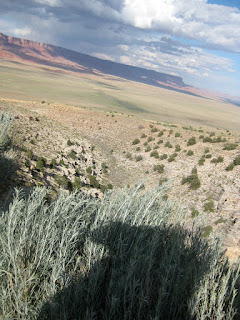 On that trip, Mom screamed every time some one got close to the edge. Somehow, it wasn’t as entertaining without her screaming at us every three minutes, so we pushed on to the Navajo Nation. Cliffs swathed in shades of pink, red, purple, gray and white lined the highway, and clouds above promised rain in a place I thought never had any. The Grand Canyon is so big and vast that it almost doesn’t seem real. But you can touch these cliffs. See boulders perched on stone columns that can’t possibly hold their weight and see colors swirl in rocks that are so old and still untouched. It absolutely takes your breath away. It was great. No one was around playing Mexican music at six a.m. or blocking our access to the creek or filling the only porta-potty with their poop. You could strip in the middle of the clearing and do a little dance or hop over the hill to go to the bathroom. We fashioned a grate out of sticks to cook our dinner, and at the end of the night, the only thing we had to worry about were animals that might come out of the woods to eat the ravioli I spilled all over the ground. Throughout all of this, I’d begun to practice mindfulness, a calm awareness of one’s surroundings that, according to Buddhists, leads to a state of enlightenment. And considering that by the time we reached Loma Linda, CA, our entire car smelled like dirty laundry, I pulled moldy bread from under the seat, the casserole we spilled on the dashboard in New Orleans was still there, we’d eaten peanut butter sandwiches for the last three meals in a row, and Stephanie had peed outside of three gas stations, mindfulness was not a luxury. It was a necessity. A voyage for a cause, very different concept. All the Best!! Read and abide by some expert advice on traveling . This could be great help to carry your trip smoothly.